I have updated my Folded Refractor page as promised earlier. Please check it out if you are interested in strange telescopes. I include the steps I take to align and collimate the scope. Since I last built one about twenty years ago I had to learn this all over again with this more recent scope. I could not find anything useful online about this process so I thought this might, at least, give someone else a place to start. Hope you enjoy! 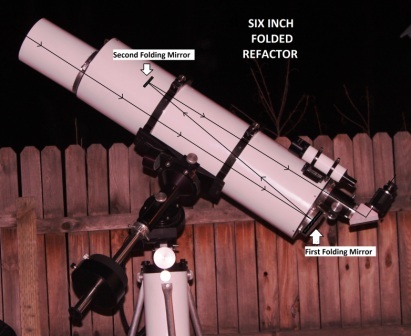 This entry was posted in Folded Refractor, Telescope Maker's Workshop and tagged compact telescope, folded refractor, folded telescope on January 18, 2013 by DaveTrott.